Robert Motherwell is regarded as one of the leading American Abstract Expressionist artists. First enthralled by the Parisian Surrealists in the 1940s, Motherwell went on to be a founding member of the innovative New York School alongside Barnett Newman, Jackson Pollock and Mark Rothko. Supported by Peggy Guggenheim, Motherwell had his first solo show at her highly influential Art of This Century Gallery in 1944. From 1943 onwards collage played an integral role in Motherwell’s artistic practice. The collages act almost autobiographically, displaying Motherwell’s affinity to certain objects. Inherited from his encounters with Surrealism and Dada, they are tied to notions of automatism and spontaneity. 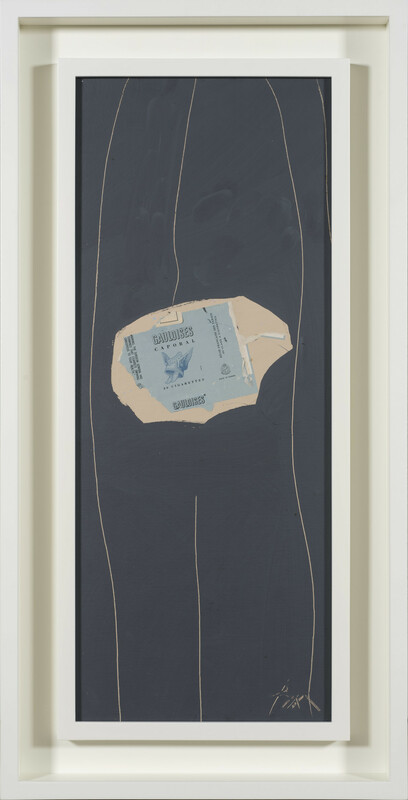 By using elements of the tangible world such as wine labels, tickets and cigarette packets, Motherwell was able to mix the realms of reality and imagination together. 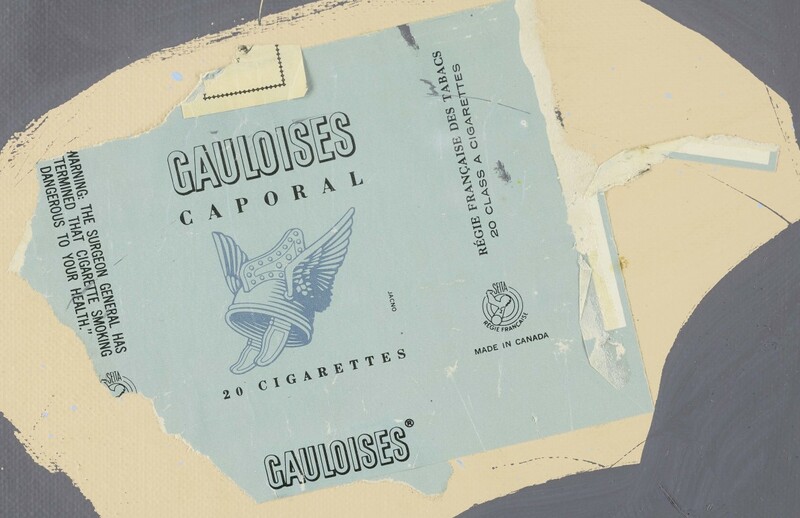 Motherwell first used torn Gauloises bleues cigarette packets in 1967. Known to smoke Lucky Strikes, Motherwell described how “I do not smoke Gauloises cigarettes, but that particular blue of the label happens to attract me, so I possess it… For a painter as abstract as myself, the collages offer a way of incorporating bits of the everyday world into pictures.” In 'Gauloises on Grey #29' Motherwell transforms an everyday object into an almost Existentialist insight into his taste and vision. 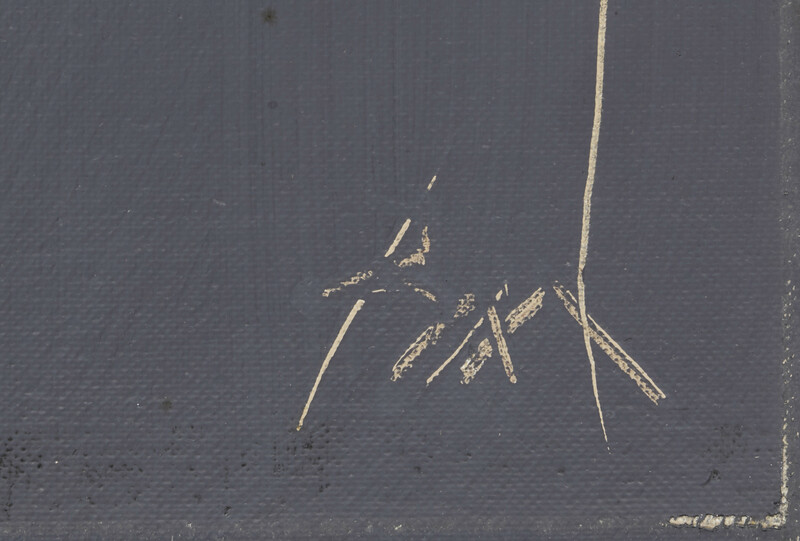 Torn by hand, the cigarette packet bears the artist’s mark upon it and makes blatant the physicality of the medium. In 1969 alongside such figures as Stanley Kunitz, Jack Tworkoy, Myron Stour, Phil Malicoat and Hudson D Walker, Motherwell founded The Fine Arts Work Center, a non-profit organisation, in Provincetown, Massachusetts. 'Gauloises on Grey #29' was acquired from Motherwell by Hudson D Walker’s daughter Harriet Walker Fitts, one time acting president of the board and co-chair of The Fine Arts Work Center. Many major institutions hold examples of Motherwell’s Gauloises works, including MoMA, New York; The Metropolitan Museum of Art, New York; Art Institute of Chicago, Chicago and The Whitney Museum of American Art, New York.